Why a Program for Teens? “The Big D” was created to promote a teen’s journey in healing, identifying the hurt from divorce, and then challenging them to find the strength to confront, accept and heal from those hurts. Through challenging the denial often associated with a parents divorce, and helping the teen push through anger issues; “The Big D” can help lead teens into the freedom necessary to understand and experience true forgiveness. 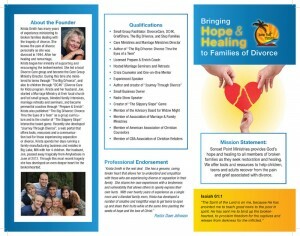 For more information, visit www.sonsetpointministries.com/thebigdinfo.